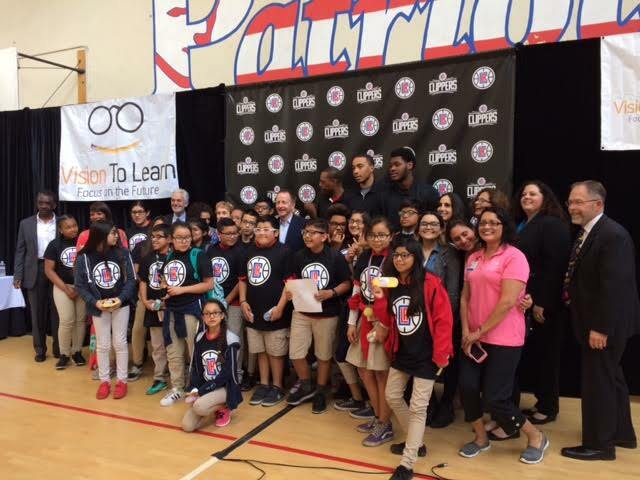 Clippers players pose for pictures with LBUSD students. Photo by Gil Fortis. All other photos by Michaela Kwoka-Coleman. To kick-off the program, Clippers players Paul Pierce, Brice Johnson and Diamond Stone distributed free reading glasses to 60 students at George Washington Middle School in the city’s Washington neighborhood Tuesday afternoon, with city and school officials, proud parents and supportive classmates in attendance. Clippers President of Business Operations Gillian Zucker, Long Beach Mayor Robert Garcia, LBUSD Superintendent Christopher Steinhauser and Vision to Learn Chair and Founder Austin Beutner also helped with the distribution. Vision to Learn, a non-profit organization founded in 2012 in Los Angeles, provides free eye exams and free glasses to children in low-income families. Long Beach students with new eye glasses pose with LBUSD officials and Clippers players. Operating out of a Clippers-branded van, the mobile eye clinic travels to different schools with licensed optometrists who administer eye exams and help children pick out frames if needed. 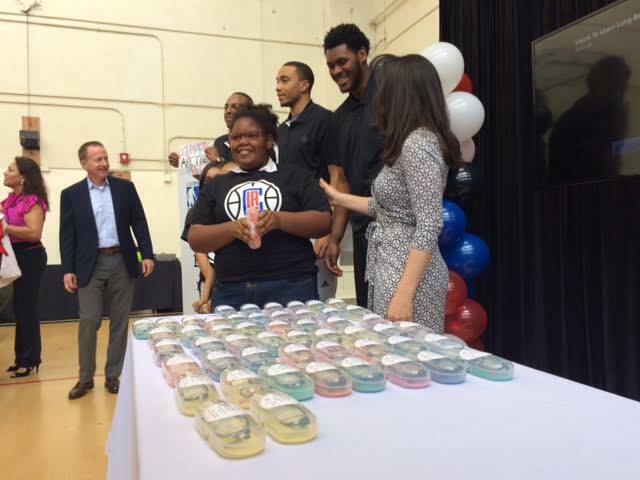 The Clippers partnered with Vision to Learn in January 2016 and distributed glasses at Inglewood High School. 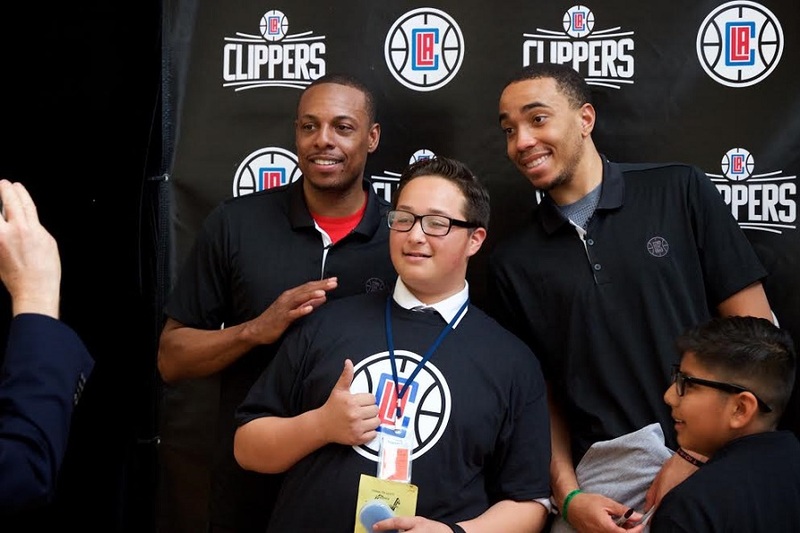 The program also provided vision services to all 12,000 students in the Inglewood Unified School District. Pierce, who joined the Clippers in 2015 as a small forward, grew up in Inglewood and said that he always wanted to give back to his home city. A Long Beach student receives a free pair of glasses. According to Vision to Learn officials, the organization targets school districts with high poverty rates, ensuring that every student gets serviced regardless of factors such as immigration status, insurance or family income. In 2015, 25.7 percent of all Long Beach residents and 27.9 percent of children lived below the poverty line, according to city data. That same year, the poverty rate for the whole state was 20.2 percent. The poverty threshold in California averages at $30,000 in income for a family of four, according to a 2014 study by the Public Policy Institute of California. Steinhauser said that providing free glasses is essential to the Long Beach College Promise and lifting people out of poverty. 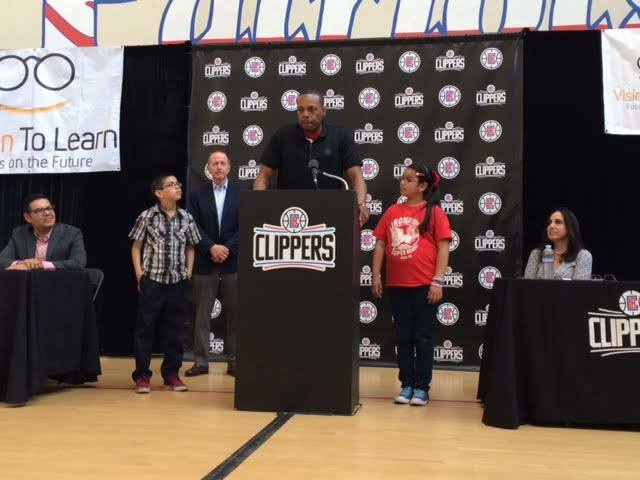 Clippers player Paul Pierce speaks at Washington Middle School. Under the Long Beach College Promise, students who graduate from an LBUSD high school can attend Long Beach City College tuition free the first year and have a guaranteed transfer admission to Cal State Long Beach, if certain requirements are met. Susana Martinez, 10, previously received glasses via Vision to Learn and was on-site Tuesday to share her experience. She said that thanks to her glasses, she is one step closer to achieving her dream of being a scientist. Garcia and Beutner said that Vision to Learn has been working with the city and LBUSD for about a year and half to get the program going. Beutner credited the city’s “can-do attitude” for the program’s success thus far. Vision to Learn is expected to finish screening and distributing glasses by the end of the year. Editor’s note: a previous version of this story stated Washington Middle School was in the Wrigley neighborhood.